I gave a video-conference talk last week considering the question, 'Do we need user-generated mapping?'. The presentation was part of the Autumn 2008 Global GIS Academy seminar series on neogeography. You can download the slides of my talk from here, although they do not make much sense in themselves. 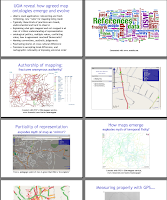 The complete manuscript of our edited book Rethinking Maps has now been submitted to the publisher Routledge. A draft of the concluding chapter titled 'Mapping modes, methods and moments: a manifesto for map studies' is now available online. The book's introductory chapter is also online. Feedback is welcome. The image left is our idea for the book cover using the concept of the 'blank map' from Lewis Carroll's poem Hunting of the Snark. Not sure if we can persuade Routledge to go with as the cover, we shall see. Hopefully the book will be in bookshops by mid 2009. 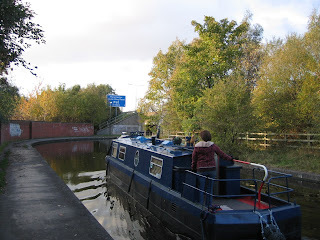 Walked along an interesting stretch of the Peak Forest canal through Hyde yesterday afternoon, including where it passes under the M67 motorway. Took this photograph of the juxtaposition of old and new transportation. Its hard to imagine the canals as a busy transportation network now.